It's seriously creepy and a lousy hotel to stay at. A friend of mine stayed there when she came to visit me because she was so wrapped up in the Elisa Lam mystery and I ended up checking the place out with her. It's really grimy and they STILL don't lock the door to the roof, even though that's where Elisa Lam died and dozens of people have committed suicide from. You can just walk right onto the roof and check out the water tanks for yourself. I want to stay there too but I definitely don't want to fall asleep there. That place is seriously creepy. hire an exorcist and it'll be alright. Location: Memphis, Tn ~ U.S.A. Please post after you've stayed there so we can hear your experiences...and know if you survived. 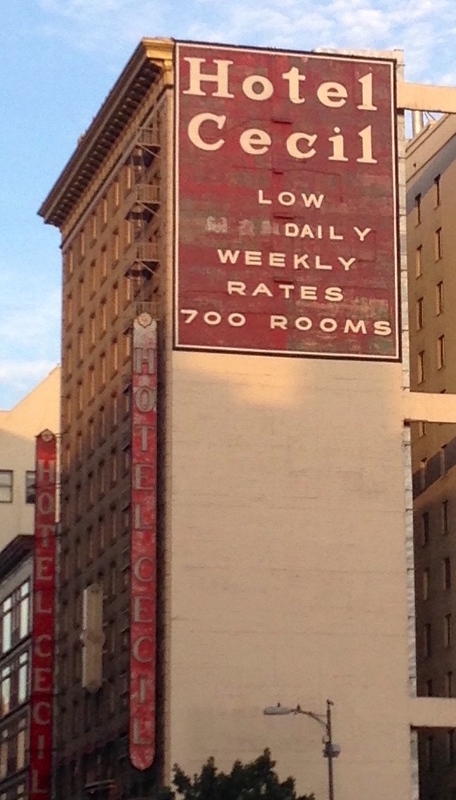 I can think of multiple nicer and less notorious hotels to stay at in Downtown. I'm curious, why are you thinking of staying there? Murders, suicides, and serial killers aside, the hotel has poor reviews. I always wondered how effective toxicology tests are when the person has been submerged in water for that long. I wouldn't want to stay in that hotel just because of fear of earthquakes. Has that place been retrofitted? It looks old. There is a lot that we'll probably never know. But the "official" story is far from complete. There's a logical explanation for everything. Mental illness can make people do strange things.